SAU went from being the only Arkansas university in 2011 without a fishing team, to angling their way to be a force to be reckoned with on the water just a few years later. The team is currently ranked 21 in the nation, according to the Boat U.S. Collegiate Standings, and thanks to John Wofford’s two big catches, SAU finished fourth and eighth in the Cabelas Big Bass Bash in Branson, Missouri. Wofford is a biology major from Delight, Ark. Wofford and teammate Adrian McFadin have already qualified for the National Guard FLW College Series Invitational on Lake Sam Rayburn in Texas this fall. They earned their coveted spot by fishing well at a qualifier at Toledo Bend in Texas. Despite the team reeling in so much success already, they are excited about getting even better next year. 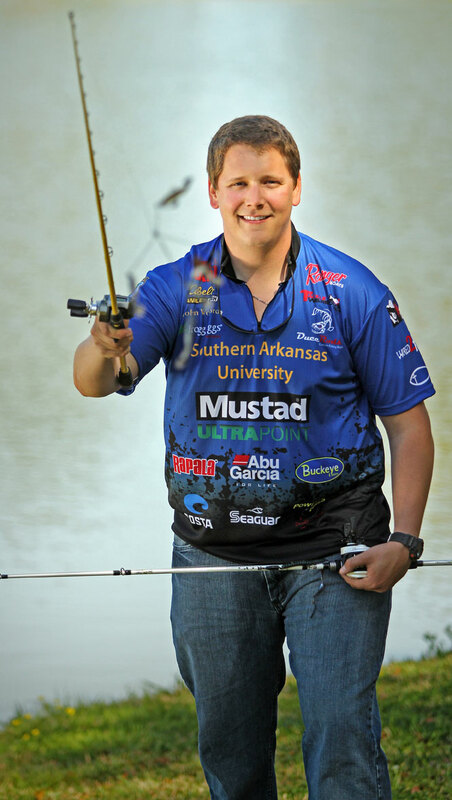 The student who inspired the creation of SAU’s fishing club, Will Reeder, is now working in the Office of Student Life and will be coaching the SAU team in the fall. 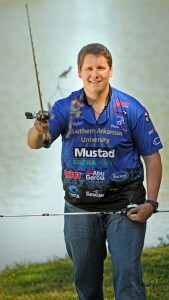 Reeder said that as far as he knows, SAU will be the first and only university fishing team in Arkansas with a coach. Reeder is working closely with the team’s faculty and staff sponsors, Dean of Students Sandra Hughes and Assistant Professor of Biology Pablo Bacon. They are hoping to find some donors to help the team with their needs for a boat or two, and team jerseys and outdoor apparel. Hughes, who considers herself a “passionate, novice fisher,” played a key role in organizing the original team two years ago and is thrilled with how it’s taken off. Hughes is certain to be gender inclusive when talking about the team members as SAU is only one of two fishing teams in Arkansas with a female angler. Lindsay Witham, a sophomore Honors College student from Benton, started fishing with her father and joined the team at SAU as a freshman. When the team is not on the water practicing or competing, they enjoy giving back. Hughes said they adopted Dudneywood Assisted Living in Magnolia for philanthropy projects. They have spent time with the residents playing bingo and visiting, and are scheduling a fishing day with their new friends in the fall. The team has also helped with the Blossom Festival fishing tournament and will hold a fishing outing with the Wounded Warriors project in July at Lake Dardanelle. If you would like to donate money, equipment or even a bass fishing boat or two, an account for the fishing team has been set up with the SAU Foundation, P.O. Box 9174, Magnolia, AR 71754, or on the SAU Foundation website by using the “Make a Gift” link. For more information, contact Hughes or Reeder at (870) 235-4047 or stulife@saumag.edu.